For exhibitors in the cat fancy who have been showing steadily for most of the show year, the end of the season is a great relief. At last, they can sit home, relax, and catch up on the regular things in their life . . . If your cat has been lucky enough to garner one of the major awards of the season, there is now a list of things you need to do in the aftermath of the season's success. In particular, there are things that the individual cat owner has to do prior to picking up their award. The first thing to consider as the season ends is sponsoring an award in your region. Most regions ask for donations to cover the cost of the trophy and rosettes that they present to each major winner. The average cost of a sponsorship is very reasonable — usually in the range of a single entry fee. You also are able to choose the cat you would like to sponsor. Sponsoring another cat is a lovely way of giving back and sharing. 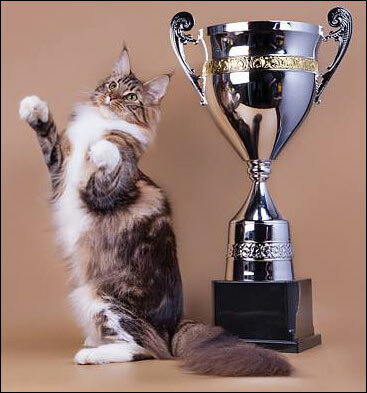 The owner of each winning cat receives an award (trophy and/or rosette). If there is more than one owner of the cat, you will need to order and pay for duplicate awards. If the owner is not the breeder of the winning cat, it is a thoughtful gesture for the owner to order a duplicate to give to the cat's breeder. While the requirements will vary slightly from one cat registry to another, generally, a cat registry will feature photos of the top winners for each year — plus the Best of Breed and/or breeding title winners on their website. You will need to provide a photo of your cat if it has earned one of the top wins or titles. Regional websites also feature photos of their top regional winners each year. 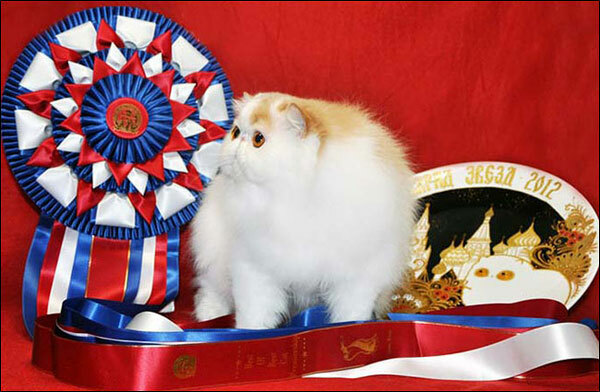 Some regional websites also feature photos of Best of Breed winners, breeding titles, agility winners, etc. Check with your region to find their requirements. Many webmasters race to have the season's winners up first . . . so make their jobs easier by sending information and photos of your winning kitty early. If your breed has a breed club website, they also often feature photos of their award winners. Be sure your cat is included. Once you have sent photos off to the various websites, it's time to plan for the actual awards banquet. At both the national and regional levels, there will be an awards dinner followed by the formal presentation of trophies and rosettes to the winning cat's owners. These are joyous, formal affairs where everyone comes to celebrate. Ladies shop for new gowns. Some men wear a tux. Each reservation to a regional and national dinner includes an awards booklet at the table setting. The booklet contains photos and info about the major winners of the night (IWs, NWs, RWs, BBs, DMs, OSs, ODs, etc) depending on your cat registry). 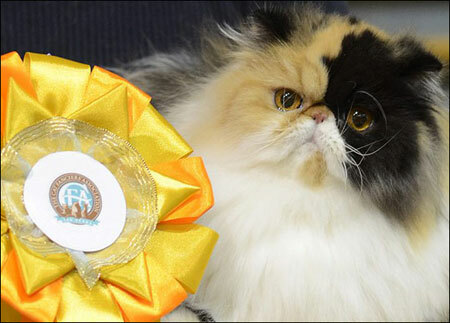 During the dinner, a slide show or PowerPoint presentation will feature not only photos of the major winners, but often photos of all cats that have earned an award right down to the Color awards. The slide show presentation often includes photos of cats whose photos are not part of the awards booklet. This is an opportunity to let everyone see your kitty one last time. Many award shows also include a slide show of informal, often amusing, photos snapped throughout the campaign season. These are not professional cat photos, but images from fellow exhibitors with cameras and cell phones that capture the casual moments at the cat show. If you have some good pix, be sure to send them to your regional person in charge. Either an original photograph or high-resolution digital file. Send as high a quality of jpeg as possible – size should be at least 1024 x 768 pixels. Photos for the booklet should be in a vertical format or be able to be cropped vertically. You may submit one photo for the awards booklet and an additional one for the on screen presentation. The on screen photo may be horizontal or vertical. Label the photograph or name the file with the cat’s registered name (do not label a photo with the cat's call name, “Smokey”). Include a self-addressed stamped envelope for the photo’s return if you send an actual printed photo. Everything associated with the awards will have a deadline — so send your submission early. Getting things in well before the deadline makes it less stressful for the people who are volunteering to put the booklet together. Once you have sent/done/finalized everything needed to honor your winner from last season, you can sit back in your favorite chair, put your feet up, invite a kitty up on your lap, and relax . . . or fill out an entry for next weekend's show. It is your choice :-).